NEW and FANTASTIC!! This soap is just the thing for your morning shower or by the sink. It has the great scent of coffee with undertones of butterscotch bourbon. It gives the coffee a nice warm scent. A great family soap. 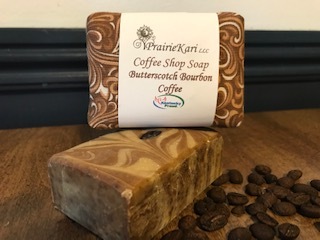 Ingredients: Olive oil, goat milk, shea butter, coonut oil, fresh brewed coffee, local goat milk, food grade lye, fragrance oil, coffee butter, kaolin clay, whole coffee bean, titanium dioxide for color. Crafted with locally roasted beans.